It's not just how much a small business makes but when the cash comes in and when the bills come due. Ventureneer's new webinar gives small business owners the chance to take control of cash flow. You don't have to be a math whiz or a computer genius to take charge of your cash flow. With the right tools, small business owners can easily forecast and manage their cash flow. This webinar will give them the tools, and take away the fear of budgeting. Small business owners often feel as if their finances are out of control. Cash flow -- having cash on hand when the bills come due -- may mean the difference between success and a "Going Out of Business" sign on the window. Many small business owners try to wing it, or get their accountants or bookkeepers to give them estimates but it's not about accounting or just writing checks. It's about planning ahead. To help small business owners take charge of cash flow and budgeting, Ventureneer.com is offering a free webinar, Know Your Numbers: Budgeting Matters (Even More) In This Economy. The webinar will be held from 12 noon to 1 p.m. on Wednesday, February 17. "To realize your business dream, you've got to set some goals; in this webinar you'll learn not only how to set them, you'll have some fun doing it," says Alan Siege. "You don't have to be a math whiz or a computer genius to take charge of your cash flow," says Geri Stengel, founder/owner of Ventureneer.com. "With the right tools, small business owners can easily forecast and manage their cash flow. This webinar will give them the tools, and take away the fear of budgeting." Learn how to use cash flow analysis and budgeting to understand where money is going. Figure out why their own cash flow is out of whack. Learn how to meet revenue targets. Gain the confidence to tackle numbers, no matter how uncomfortable they might be now. Take home sample templates to use with their own businesses. Learn to create simple forecasts of cash flow that can easily be changed as events change or can be changed to evaluate the effects of different courses of action. This interactive webinar will be taught by Alan Siege, CEO/Owner, Small Business Management Consulting, which specializes in small business advice. He is an instructor for the NYC Department of Small Business Services Entrepreneur Boot Camp as well as being an adjunct professor at the Borough of Manhattan Community College and at New York University. To learn more about the webinar or to register, visit Ventureneer's website. 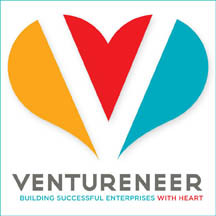 Ventureneer.com provides non profit and small business advice as well as entrepreneurial and non profit training through a new approach to learning: a blend of traditional, formal instruction with informal, peer learning that takes advantage of Web 2.0 technology to capture and share knowledge. Ventureneer's customized blogs, virtual classes, peer-to-peer learning, coaching, web events and articles help entrepreneurs make faster, better decisions for their enterprises.